MUFF WIGGLER :: View topic - Is this Buchla 281 working properly??? Is this Buchla 281 working properly??? Picked up this quad function generator 281 used and it's behaving differently than the 281h I own. Not sure if the difference is normal or if there is an issue with it. to retrigger 'B' creating an odd rhythm. I love the results I get from this method! Was hoping to do the same using 4 cascading function generators on the 281 but the behavior is completely different and illogical. If 'A' pulse out is run into 'B' it just assumes the same rate at 'A', so no odd rhythms possible. What's worse, if 'B' cycles at a faster rate than 'A' it cause 'A' to trigger at the rate of 'B'! mode is off. If I run a pulse from 281h into 281 it functions as I believe it should. You get odd rhythms. conclusions without feedback from more experienced users. If this is malfunctioning and you are a builder that can correct it, please let me know approximate cost. i don't know why, but both versions i have v-1 and v-2 do this . the "issue" you are having. i usually use the voltage out from one to modulate the decay of another to get interesting rhythms . i am interested in someone with a vintage original verifying if this behavior is normal/correct? Ok, I feel a little better now. Still disappointed but better. I've also used modulating attack/decay to get odd rhythms but in some instances this method gives me better results. Oh well, I can always send pulses from 281h to get it to work as I want. weird, the 281e does not do that. I have just tried out the above patch on my 281 with the above modifications. As shown in the video -- both channels on fastest attack and varying decay -- it does not operate as the 281h does, and is a bit like the 281r shown in the video though not exactly the same. But, I can get something like the 281h behaviour by having channel A's envelope the other way around, i.e. fastest possible decay and varying attack. I guess this is something to do with channel A not retriggering while the attack is still rising, so B cannot perform the undesirable modulation of A.
Yep, it doesn't work as the 281e... completely illogical behavior indeed. I sent mine back to Roman, long time ago, for repair... who sent it back to me, in the exact same state six months later. Thank you to everyone for all the responses. guess I'll eventually have to upgrade to 281e. ...But, I can get something like the 281h behaviour by having channel A's envelope the other way around, i.e. fastest possible decay and varying attack. I guess this is something to do with channel A not retriggering while the attack is still rising, so B cannot perform the undesirable modulation of A.
of course, I then take the pulse out to a 3rd function generator not cycling! use this for percussive sounds so adding attack is counter productive. The way I patched it, the channel with the longer attack was just being used to retrigger the other one. So the envelope I was listening to was fast-attack-longer-decay, and had the bouncy rhythm we're going for, while the retrigger-generator was longer-attack-fast-decay. Edit: obviously it does mean you can't also use the retriggering channel as a percussive envelope. think I can deal with it. I kind of like the lazy swing it brings into the mix. that is definitely not normal. This concerns me as i am about to finish up a 281 and this is one of my favorite ways to patch it. I have a 281r rev 3 board set that I've started to populate, I have the modularsynthesis.com page bookmarked, I figured the mods listed there would get this thing working properly, but it seems not? What a bummer, perhaps I should cut my losses and unload this thing. It shows quite nicely how the diodes should be on the pulse outs, wiring of the mode switch etc. I don't have a 281r to compare, but maybe someone could trace out the 281r and check how it compares to this? It means that with diode D11 installed, a gate at the input is able to hold the FG high as in ASR mode; without it, you can only retrigger the FG as it decays. Oh and also folks seem to be describing the result of putting a pulse into an oscillating 281 as retriggering. In my experience on this Topp PCB the pulse not only retriggers the oscillation, by putting in a held pulse to the 281's trigger, for example from a 216 pulse out and holding down the "key", the oscillation stops. Which is a nice way to get wonky patterns out of it as well. Would be interesting to check if/how 281r modules handle that, and if that matches a "real" 281. It's good to hear that the toppobrillo version behaves as one would expect. When I was building my 281r (rev 3) I tried tracing out the circuitry for transient vs sustain switching and could not understand what it was supposed to do at all.I didn't keep my drawing but I remember that as far as I could tell at the time it had no chance of working. 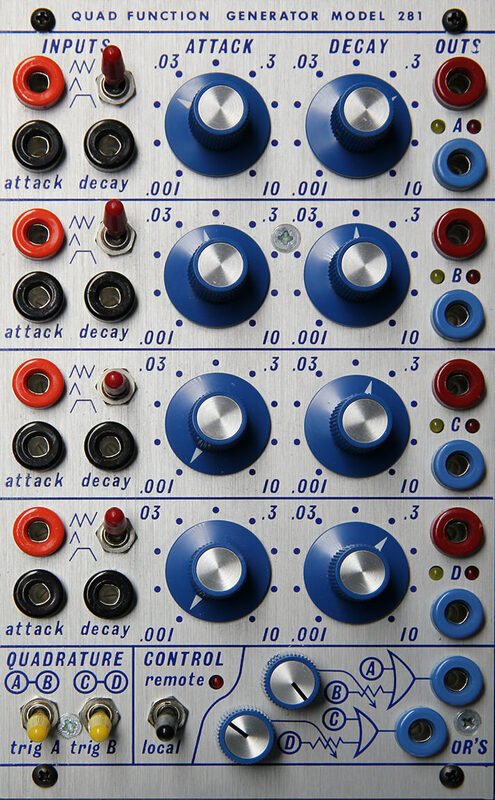 I was comparing with the Buchla schematic (which also does not look like it will work) and the Toppobrillo one, which looks like a smart tweak to the Buchla one which might have a chance, but it matched neither. In the end I gave up and made the mods Dave Brown suggested, and it mainly works, but the patch discussed in this thread is problematic. Me it's a 248r which never worked since day 1 because of a faulty microchip or a crackle on the pcb. I dunno. Paid for repair and got it back unchanged. Never answered my mails after that. Go on, then. I ENCOURAGE YOU (a bit). It would be nice to actually build this thing up and have it work to original spec. It is highly discouraging, enough that I'm contemplating trading out the 259 PCB set that I got at ther same time as well. The ridiclous thing is that I have a set of four of the original issue toppo 281 boards that I have largely populated and have been planning on building into a Wiard 300 format module, should have put my efforts into that I think. I also have a sick 281r. I just wish there was a bit less fabrication work (brackets etc.) involved in building two of the Toppo 281 boards behind a Buchla panel, or I'd do that. It's fairly annoying that one of the most important modules in the format is so badly behaved, at least this version of it. That was all it took, as it happens. 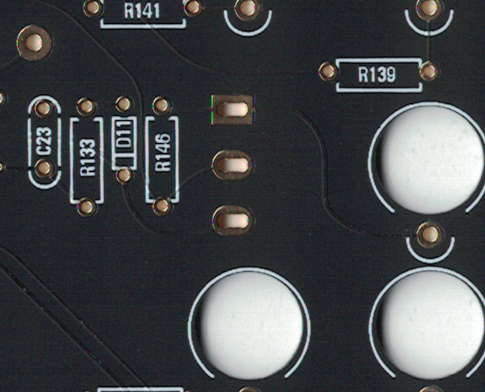 Here's the circuitry as traced out on my 281r rev 3 board. I did not manage to figure out what the connections to the main board really were so you have my best guess that they lead to the pulse and trigger circuitry -- which they must do, really. The switch is really a SPDT ON-OFF-ON. I've drawn it as three poles so you can see the middle "OFF" position which is the "transient" (AR) mode. This circuit obviously does not work. The resistor/cap from +15V to a diode and to the cycle point is doing nothing useful. The only difference between transient and sustain mode is that in sustain the trigger jack connects directly to the rest of the circuit and in transient it goes via a 100k resistor. Dave Brown's mod changes this resistor to a capacitor which means that the input becomes a pulse; at least that makes some sense. Toppobrillo one looks like it might actually work. The Buchla drawings that are around on the web use the same parts again in a different configuration which I also cannot understand. I think they are misdrawn and that Josh figured out the right way to redraw them for his boards, while Roman did not. If you take two of the Roman circuits and switch them both to CYCLE, and then patch the PULSE OUT of the first into the TRIGGER IN of the second, you can see that the pulse out of the second also gets indirectly connected back to the trigger circuit of the first. That is why we are seeing the behaviour in this thread where the second envelope controls the first. Now that we can see what is going on, it might be possible to modify these boards so that they work. Does someone want to send me one to perform some surgery on? I think I have a little mod worked out which will remedy this issue. If anyone is currently building, you could try it: when doing Dave Brown's mod, replace R146 (and the other three corresponding resistors) with not just a capacitor but a capacitor and diode in series. If you wait a few days I might be able to try this out and report back. but i would perform the mod test mod tomorrow . could you schematically annotate this pic? also what value of capacitor and diode? lets get this sorted out! I am now thinking it is a little more complicated than I suggested above, but only a little. We need to make arrangements so that the capacitor can discharge, which means replicating the Toppobrillo circuit, more or less. I have a plan for that but I think I had better try it out myself before getting your board all messed up! longstanding issue that is finally getting the attention it deserves. Thank you, cygmu! If you find a solution you will be a hero. If I were in Europe I'd send you mine to experiment on. I'm in the US. Should I still send it??? Haha, no, it's ok, I am getting confident now and as soon as I have a chance I will attack my board. My confidence has been bolstered by a chat with Dave Brown who seems to agree with what needs to be done. I am pretty happy about this too so thank you! OK, the mod is installed, tested and confirmed working in my rev 3 boards. followed by a diode -- any small signal diode will do e.g. 1N4148. This should be oriented from top to bottom of the resistor pads, i.e. the diode cathode goes to the bottom pad, the other end of the parallel resistor and cap go to the upper pad. Alternatively you can wire this assembly directly from the trigger jack to the pole (middle pin) of the switch, so that the diode cathode connects to the switch. You can remove C23, R133 and D11 (and the corresponding parts in the other sections) if you want, but if they are already there, it does not hurt to leave them in. Ever efficient, Dave Brown has already updated his web page with this information, including a diagram. I have given my 281 a quick test in all the standard patches that I use, plus the one that started this thread, and it all seems to work. I think I get my "Buchla DIY" scout badge now. If someone with a different version of the boards is able to have a look and figure out how to apply the corresponding modification, that would be great.